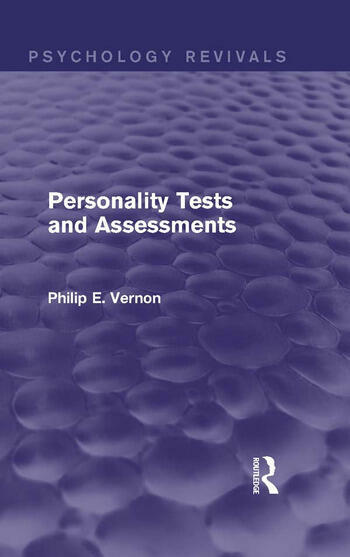 Originally published in 1953 this book provided the first comprehensive account of methods of personality assessment by a British author. It starts with a short survey of personality theory, pointing out the difficulties in any method of testing or assessment. Next it describes the weaknesses of the common interview method. (Throughout the emphasis is on methods which are usable in educational or vocational guidance and selection, not on methods which are mainly of scientific interest.) Thereafter it takes up each main type of technique – tests based on physique or psychological measures, on expressive movement such as gestures and handwriting, tests of behaviour (including War Office Selection Board ‘house party’ methods), ratings and rating scales, questionnaires, and so-called projective techniques. The evidence for or against each test or method is surveyed and numerous references provided for relevant literature. Illustrative excerpts are given of many of the more promising tests, and some pictorial illustrations. British work in this field at the time is covered completely, and an attempt is made to provide a fair summary of the main contributions of American and other psychologists of the day.